ថ្ងៃ២២មេសា លោកនិច្សុនបានអនុញ្ញាតអោយមានការធ្វើផែនការ​នៃការលុកលុយរបស់វៀតណាមខាងត្បូងទៅកាន់ចំពុះសេក (បានដាក់ឈ្មោះតាមទ្រង់ទ្រាយសណ្ឋានដែលបានសង្កេតឃើញលើផែនទី) ដោយជឿថា "ជាការផ្ដល់អោយពួកវៀតណាមខាងត្បូងនូវប្រតិបត្តិការផ្ទាល់ខ្លួនមួយ អាចនឹងជាការលើកស្ទួយដ៏សំខាន់ដល់ទឹកចិត្តរបស់ពួកគេក៏ដូចជា ផ្ដល់អោយមានការធ្វើអោយឃើញនូវការអនុវត្តនៃជោគជ័យវៀតណាមនីយកម្ម ។" នៅថ្ងៃបន្ទាប់ លោករដ្ឋលេខាធិការវីល្លៀម-ផ.រ៉ចចឺរបានធ្វើកសិណសាក្សីពីមុខសភាគណៈកម្មាធិការត្រួតពិនិត្យថា "រដ្ឋបាលគ្មានចេតណាមួយ...ដើម្បីធ្វើអោយមានសង្គ្រាមរឹតតែខ្លាំងនោះទេ ។ យើងទទួលស្គាល់ថាបើសិនជាយើងធ្វើអោយកាន់តែខ្លាំងឡើង និងនាំពាក់ព័ន្ធនៅកម្ពុជាជាមួយនិង កងទ័ពជើងគោករបស់យើង នោះកម្មវិធីទាំងមូលរបស់យើង[វៀតណាមនីយកម្ម]គឺត្រូវបរាជ័យទាំងស្រុង ។"
នៅល្ងាច ២៥មេសា លោកនិច្សុនបានបរិភោគអាហារល្ងាចជាមួយមិត្តរបស់លោកបេបេ-រេបូហ្សូ និងលោកឃិស្ស៊ិងហ្គឺរ ។ ពេលក្រោយមកទៀត ពួកលោកបានបិទបាំងមួយនៃចំណោមកុនពេញនិយមនានារបស់និច្សុន គឺភែថ្ថុន,ការពិពណ៌នាជីវប្រវត្តិនៃឧត្តមសេនីយ៍មានវាទប្បដិវាទ លោកចច ស.-ភែថ្ថុន ជេអ. ដែលលោកបានមើលប្រាំដងមុនរួចហើយ ។ លោកឃិស្ស៊ិងហ្គឺរក្រោយមកបានអោយយោបល់ថា "នៅពេលនោះគាត់បានផ្អិបខ្លួនទៅនឹងជញ្ជាំង ស្នាមរំជួលចិត្តរបស់គាត់ [និច្សុន]បានផុសឡើងហើយលោកនឹងឃើញខ្លួនឯង​ជាមេបញ្ជាការកងទ័ពដែលបានឡោមព័ទ្ធទៅដោយទម្លាប់​នៃលោកភែថ្ថុន ។"
ដើម្បីទុកយុទ្ធនាការនេះជាគន្លឹះដ៏តូចតាមតែអាចទៅរួច លោកឧត្តមសេនីយ៍អាប្រាម្ស៍បានណែនាំថា ការផ្ដើមការលុកលុយត្រូវបានប្រកាសដដែលៗពីសៃហ្គន ។ នៅម៉ោង២១:០០ថ្ងៃ៣០មេសា យ៉ាងណាក៏ដោយ ក៏លោកប្រធានាធិបតីនិច្សុនបានបង្ហាញខ្លួនលើបណ្ដាញទូរទស្សន៍ស.រ.ទាំងអស់បីដើម្បីប្រកាសថា "វាមិនមែនជាអំណាចរបស់យើងទេ ក៏ប៉ុន្តែឆន្ទៈនិងចរិកលក្ខណៈរបស់យើងដែលកំពុងត្រូវបានសាកល្បងយប់នេះ" ហើយថា "ពេលវេលាបានមកដល់ហើយសម្រាប់ការប្រយុទ្ធ ។" លោកបានប្រកាសការសម្រេចចិត្តរបស់លោក​ដើម្បីរៀបចំកងកម្លាំងអាមេរិកទៅកាន់កម្ពុជាជាមួយកម្មវត្ថុពិសេស​ក្នុងការកាន់កាប់ "ទីបញ្ជាការប្រតិបត្តិការយោធាកុម្មុយនិស្តទាំងមូលនៅវៀតណាមខាងត្បូង ។"
↑ John M. Shaw, The Cambodian Campaign. Lawrence KS: University of Kansas Press, 2005, p. 158. His original source was the Current Historical Evaluation of Counterinsurgency Operations (Project CHECO). ↑ Cambodian neutrality had already been violated by South Vietnamese forces in pursuit of political-military factions opposed to the regime of Ngo Dinh Diem in the late 1950s and early 1960s. Arnold R. Isaacs, Gordon Hardy, McAlister Brown, et al. Pawns of War Boston: Boston Publishing Company, 1987, p. 54. ↑ Samuel Lipsman, Edward Doyle, et al. Fighting for Time. Boston: Boston Publishing Company, 1983, p. 127. See also Military Institute of Vietnam, Victory in Vietnam, Lawrence KS: University of Kansas Press, 2002, p. 465, fn24. ↑ Wilfred Deac, Road to the Killing Fields. College Station TX: Texas A&M University Press, 1987, p. 55. ↑ Bernard C. Nalty, Air War Over South Vietnam Washington DC: Air Force History and Museums Program, 1997, p. 127. ↑ Isaacs, Hardy and Brown, p. 90. ↑ ១១,០ ១១,១ Lipsman and Doyle, p. 144. ↑ Herman L. Gilster, The Air War in Southeast Asia. Maxwell Air Force Base AL: Air University Press, 1993, p. 20. ↑ ១៦,០ ១៦,១ Lipsman and Doyle, p. 147. ↑ Shelby L. Stanton, Rise and Fall of an American Army. New York: Dell, 1985, pp. 319–320. ↑ ១៨,០ ១៨,១ Lipsman and Doyle, p. 149. ↑ ១៩,០ ១៩,១ ១៩,២ ១៩,៣ Lipsman and Doyle, p. 152. ↑ Isaacs, Hardy and Brown, p. 146. ↑ Lewis Sorley, A Better War. New York: Harvest Books, 1999, p. 202. ↑ Stanley Karnow, Vietnam. New York: Viking, 1983, p. 607. ↑ Lipsman and Doyle, p. 153. ↑ Tri's operation was to have begun on the 29th but the general refused to budge, claiming that his astrologer had told him "the heavens were not auspicious". Shaw, p. 53. ↑ Lipsman and Doyle, p. 164. ↑ (PAVN casualties) Lipsman and Doyle, p. 164. (U.S. casualties) Denis Kennedy Tracks in the Jungle. Boston: Boston Publishing Company, 1987, p. 137. ↑ ៣៦,០ ៣៦,១ ៣៦,២ Sorley, p. 203. ↑ A vivid, first-hand account of the battle can be found in William K. Nolan, Into Cambodia. Novato CA: Presidio Press, 1986, pp. 147–161. ↑ ៣៩,០ ៣៩,១ Lipsman and Doyle, p. 167. ↑ Nolan, p. 272. The 3rd Brigade was the last major element of the 9th Infantry Division remaining in South Vietnam, the remainder having been withdrawn in the summer of 1969. At the time of the incursion, the 3rd was under the operational control of the 25th Infantry Division. ↑ ៤៧,០ ៤៧,១ ៤៧,២ Lipsman and Doyle, p. 174. ↑ During these operations South Vietnamese and American naval forces evacuated about 35,000 Vietnamese from Cambodia. Shaw, p. 146. ↑ Lipsman and Doyle, p. 177. ↑ John Schlight, A War Too Long. Washington DC: Air Force History and Museums Program, 1986, pp. 183–184. ↑ John Morocco, Operation Menu, Boston Publishing Company, 1988, p. 146. ↑ ៥៦,០ ៥៦,១ Morocco, p. 148. ↑ Abrams was fortunate—had PAVN fought for the sanctuaries instead of fleeing, U.S. and ARVN units would have rapidly consumed their available supplies. Shaw, p. 136. ↑ The tempo of logistical troops could be mind numbing. The U.S. Third Ordnance Battalion for example, loaded up to 150 flatbed trucks per day with ammunition. Logisticians were issuing more than 2,300 short tons (almost five million pounds) of supplies every day to support the incursion. Shaw, p. 135. ↑ Prados, The Blood Road. New York: John Wiley and Sons, 1998, p. 191. ↑ Victory in Vietnam, p. 382. ↑ Todd Gitlin, The Sixties, New York: Bantam Books, 1987, p. 410. ↑ Lipsman and Doyle, p. 182. ↑ Fulghum and Maitland, p. 9. ↑ Brigadier General Tran Dinh Tho, The Cambodian Incursion. Washington DC: United States Army Center of Military History, 1979, p. 182. ↑ Shaw, pp. 161–170. See also Stanton, pp. 324–325 and Dave R. Palmer, Summons of the Trumpet. Novato CA: Presidio Press, 1978, pp. 300–301. ↑ Due to lack of verifiable sources in the Socialist Republic of Vietnam, this figure is, at best, an estimate. The official Vietnamese figure of losses in transported supplies in 1970 was 3.4 percent. Victory in Vietnam, p. 261. 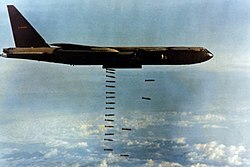 The U.S. Air Force's best estimate for the same time period was that one-third of the total amount was destroyed in transit. Bernard C. Nalty, War On Trucks, Washington DC: Air Force History and Museums Program, 2005, p. 297. ↑ Lieutenant General Sak Sutsakhan, The Khmer Republic at War. Washington DC: United States Army Center of Military History, 1984, p. 174. ↑ Colonel Perry Lamy, Barrel Roll, Maxwell Air Force Base AL: Air University Press, 1995, p. 47. Military Assistance Command, Vietnam, Command History 1967, Annex F. Saigon, 1968. Military Institute of Vietnam, Victory in Vietnam: The Official History of the People's Army of Vietnam, 1954–1975. Lawrence KS: University of Kansas Press, 2002. Lamy, Colonel Perry L. Barrel Roll, 1968–1973: An Air Campaign in Support of National Policy. Maxwell Air Force Base AL: Air University Press, 1995. Nalty, Bernard C. Air War Over South Vietnam: 1968–1975. Washington DC: Air Force History and Museums Program, 2000. Nalty, Bernard C. War Against Trucks: Aerial Interdiction in Southern Laos, 1968–1972. Washington DC: Air Force History and Museums Program, 2005. Sutsakhan, Lieutenant General Sak, The Khmer Republic at War and the Final Collapse. Washington DC: United States Army Center of Military History, 1984. Tho, Brigadier General Tran Dinh, The Cambodian Incursion. Washington DC: United States Army Center of Military History, 1979. Deac, Wilfred, Road to the Killing Fields: The Cambodian Civil War of 1970–1975. College Station TX: Texas A&M University, 1997. Fulghum, David, Terrence Maitland, et al. South Vietnam on Trial: Mid-1970–1972. Boston; boston Publishing Company, 1984. Gitlin, Todd, The Sixties: Years of Hope, Days of Rage. New York: Bantam Books, 1987. Kennedy, Denis, Tracks in the Jungle in The Army at War. Boston: Boston Publishing Company, 1987. Lipsman, Samuel, Edward Doyle, et al. Fighting for Time: 1969–1970. Boston: Boston Publishing Company, 1983. Morocco, John, Operation Menu in War in the Shadows. Boston: Boston Publishing Company, 1988. Morocco, John, Rain of Fire: Air War, 1969–1973 Boston: Boston Publishing Company, 1985. Nolan, Keith W. Into Cambodia: Spring Campaign, Summer Offensive, 1970. Novato CA: Presidio Press, 1990. Prados, John, The Blood Road: The Ho Chi Minh Trail and the Vietnam War. New York: John Wiley and Sons, 1998. Shawcross, William, Sideshow: Kissinger, Nixon and the Destruction of Cambodia. New York: Washington Square Books, 1979.